Touchstone Mobile is available from Google's Play Store. 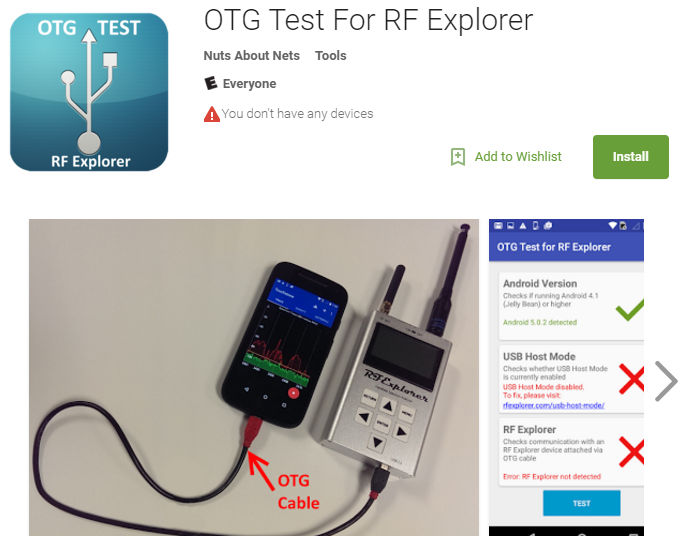 For evaluation purposes the app is free to download and install and can be run in "Demo" mode without an RF Explorer device. 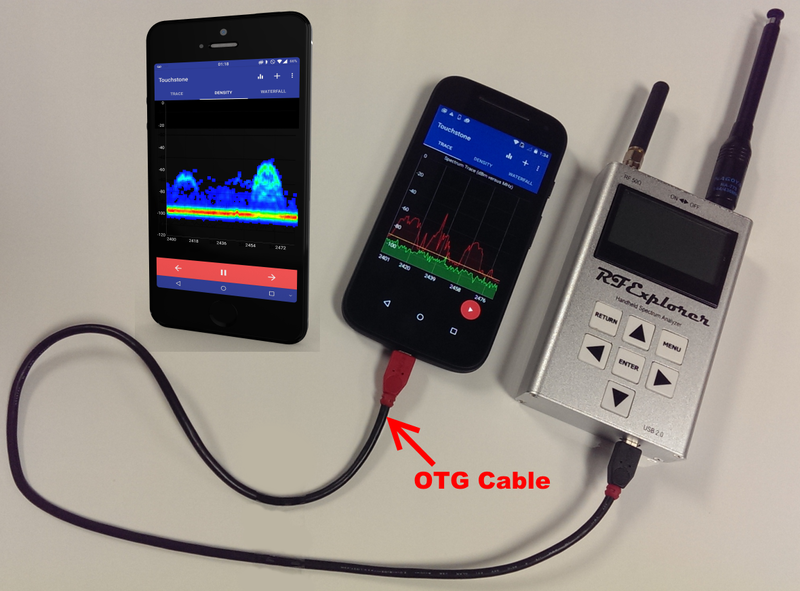 A software license key costs $49 USD and enables the app to use an RF Explorer device to collect spectrum trace data in real-time. Documentation for Touchstone Mobile can be found here. 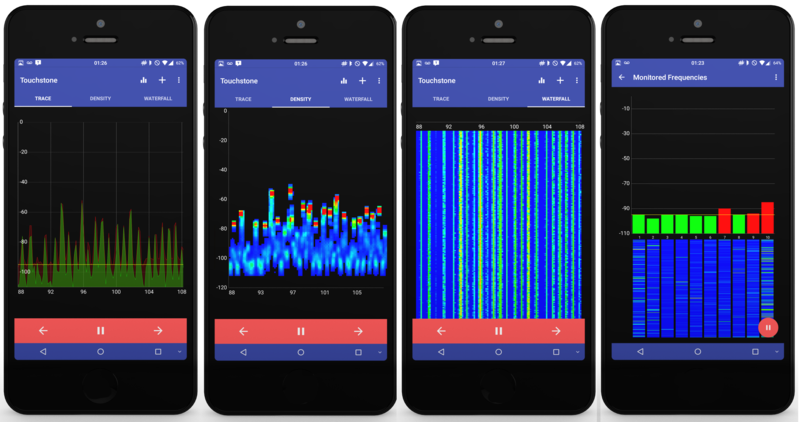 Touchstone Mobile continuously scans and samples the signal strength (dBm) of frequencies in the range the user has specified. In the 'Spectrum Trace' view the signal strength data (in dBm) is displayed as a function of frequency. The 'Density Map' shows accumulated RF energy as a function of frequency. The power of the signal strength in dBm is shown across the frequency span. A signal strength with a relatively low occurrence is 'blueish' in color, whereas increasingly brighter colors are used for signal strengths that occur more frequently. Signal strengths that occur most often are 'redish' in color. Over time, this spectral view will approximate the steady-state RF energy signature or pattern of a given environment. RF Explorer spectrum analyzer is a very unique device. Together with Touchstone Mobile software you now have an RF diagnostic tool unmatched in price and performance. Armed with the ability to monitor RF signals, detect RF interference and view all RF activity that occurs in your environment, solving wireless problems just got a whole lot easier.